How many of you find yourself motivated to make New Year's resolutions, only to drop them and end up feeling discouraged ? Maybe you want to lose weight, exercise more, eat a healthier diet or have more time for yourself. When you start integrating simpler, more manageable healthy habits into your daily routine that you do consistently, it is much easier than making ambitious goals. The small things that you do for your health add up, allowing you to prevent disease and feel better every day. There are many self-care routines that you can incorporate this year. 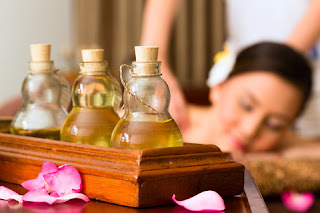 These are practices that you can do on your own such as: self-oil massage, dry skin brushing, baths with therapeutic salts or morning stretches. Self-care also means tune-ups with your naturopathic doctor - depending on your state of health, this could mean monthly acupuncture sessions, regular massages or body work to realign yourself. Just like you go to the dentist every 6 months and brush your teeth daily for oral health, self-care is essential for optimal health and prevention of disease. Many people often go to the doctor when they are sick or have pain however, the naturopathic approach helps identify and prevent illness before you feel symptoms, saving you time and money in the long term. When you take care of yourself, you will naturally be able to take care of the things around you that matter most: kids, family, career etc. Some people feel guilty taking time for themselves; it's not about being selfish, but instead it's about nurturing yourself. When your body, mind, emotions and spirit are in harmony with each other, you will not only feel great, but you will feel fulfilled with your life purpose. According to Ayurveda, dinacharya is a term used to describe daily routine and self-care practices which restore balance and attune ourselves to the natural fluctuations of nature. Below are a few suggestions for you in the new year and beyond. 1. Start the day with a warm glass of water. Sounds so simple, but how many of us actually do it regularly? This will help flush out accumulated toxins after the night and stimulate the digestive system to cleanse. For some individuals, lemon-water or light herbal teas may be advised. 2. Eliminate. No matter how much good food your eat or quality supplements you take, if you are not emptying your bowels in the morning regularly, you are accumulating waste material. Spending the time in the morning to eliminate is a basic healthy habit. If you struggle with constipation, you should speak with your naturopathic doctor as it is a sign of imbalance. 3. Care for your body. Depending on your constitution and the season, self-oil massage or dry skin-brushing can help nourish and cleanse your skin. For example, if you have a vata constitution, a warm oil self massage prior to showering can promote circulation and be a grounding to start the day. If you have a kapha constitution, dry skin brushing can also help stimulate lymphatic drainage. 4. Exercise and/or meditate. It may initially seem difficult to do, but starting the day consciously with even 5 minutes of meditation will enhance the quality of your day. Kapha body types need more vigorous exercise, while vata types need gentler movement or meditation and pitta types need moderation. 5. Start the day with a nourishing breakfast balanced with enough protein - don't skip it before rushing out the door or replace it with a sweet beverage that will spike your blood sugar levels and leave you feeling depleted. Aim for lunch to be the largest meal of the day, and dinner to be early and lighter for digestive health. Try to learn more about your Ayurvedic constitution so you can make dietary choices more aligned for your body. (Learn more about seminars on this topic here). 6. Hydrate! Seems easier said than done, but it is crucial to have adequate water during the day to keep your skin soft and support cellular detox. Aim for 7-9 glasses of water per day. Drinking warm or adding lemon, ginger or other herbs can make it more palatable for those who don't like to drink water. There are also many herbal teas in the clinic that are therapeutic. Preparing a warm cup of tea can be very healing in itself, in addition to the therapeutic benefits of the herbs which work gently but effectively. 7. Schedule in appointments for self-care ahead of time rather than waiting until symptoms come up. If you struggle with body pain, regular bodywork can be very effective at preventing issues from worsening. For example if you suffer from tension headaches, monthly acupuncture can keep them at bay. If you have arthritic pain, regular Ayurvedic oil massage can nourish the joints and prevent poor circulation in the winter. These treatments can be done weekly, monthly or at every season transition. Cupping can also be done monthly or every 3 months for maintenance for muscle tension, scar tissue or detox. Speak to your naturopathic doctor on what would be the best maintenance treatment frequency for you depending on your health status. 8. Castor oil packs are very effective for reducing inflammation and detoxifying the liver. If you struggle with digestive complaints, menstrual issues or have a sluggish liver, speak with your naturopathic doctor on how often you can do castor oil packs. Adding this to your daily routine will feel good. 9. Treat yourself to a hot bath with alkaline salts and essential oils. Your skin is the largest organ of elimination, and in winter time we barely sweat. Soaking in a hot tub with ease tight muscles, allowing minerals to nourish your skin and eliminate toxins. If you have skin issues, you may need to soak 3x/week, otherwise a weekly bath can wash away physical and mental emotional residue. 10. Sleep on time. Most people find themselves in a vicious cycle of struggling to get up and get everything done in the day, and sleeping later than planned. Quantity and quality of sleep are equally important, and can be promoted by simple sleep self-care routine such as: foot baths or massages before bed, screen-free time, meditation or listening to soothing music. If you end your day with a restful sleep, you will find your quality of day will improve, leaving you more time to do the things you love to do. 11. Regular appointments with your Naturopathic Doctor. Remember that the conventional medical system is geared to treat disease and while it can be effective in acute situations, it is not as preventative in nature. The naturopathic approach involves identifying signs of imbalance even before you feel symptoms or before your bloodwork results come out abnormal. Regular wellness checks are an important aspect of self-care and will enable your ND to work with you to identify imbalances early on and guide you on how you can prevent certain disease that you may be susceptible to. For healthy individuals, yearly wellness checks that include a physical exam may be sufficient for health promotion, just like you would for your family doctor. For most people though, appointments every few months may be required just like you would with your dentist or any health care provider. Try introducing 1-2 of the self-care tips into your day this week until it's established, before introducing another routine. Once healthy routines become healthy habits, it will seem less daunting and easier to do. Remember, when you take care of yourself, you will be able to improve the quality in many aspects of your life, so it pays off. If you are feeling challenged with any of the tips above or want to know what self-care routines are best for you, speak to your naturopathic doctor. Support and guidance can help you stay on track, and keep you inspired to make this year healthier than ever before! Dr. Leena Athparia is a naturopathic doctor & Ayurvedic practitioner at Naturopathic Foundations with a focus in joint health, pain and chronic disease. If you are healthy and looking into preventing disease or learning more about your constitution, Dr. Athparia can help you. Please call the clinic at 905-940-2727 to book an appointment.